My favorite image from the story of The Prodigal Son is of the father running to meet his son. I love this old song from Benny Hester: When God Ran. 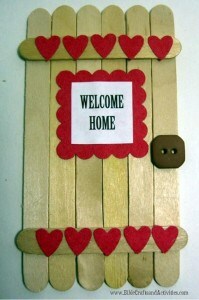 With this craft I wanted to emphasize the “welcome home” the father gave to his returning son. This door was created with two different sizes of craft sticks adhered together with white glue. We added a welcome home greeting and a button for a door knob. You can decorate yours with paper punch shapes or stickers. I added the verses above to the back. You can download the printable for the door sign and scripture verses here.